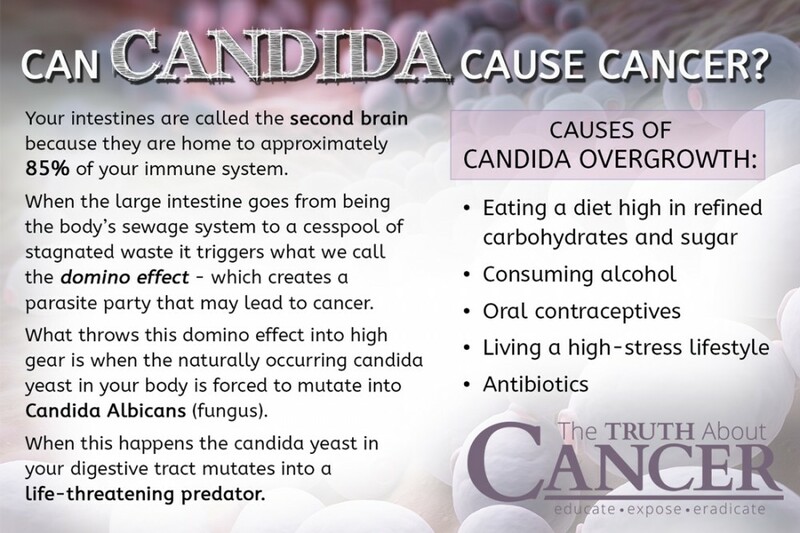 You are here: Home / Cancer Causes / Is There a Link Between Candida Albicans & Cancer? The intestines are called the “second brain” because they are home to approximately 85% of your immune system. Interestingly, most of your emotions are processed in the intestines not in the brain. This is why when you cannot process your emotions properly, you become sick to your stomach. The large intestine is the last 5 to 7 feet of the digestive tract. It is known as the mother of all organs and contains the majority of your immune system, making it the most important part of your intestines. But when the large intestine is mismanaged and left in a weakened and toxic state, the end result is often cancer. When the large intestine goes from being the body’s sewage system to a cesspool of stagnated waste it triggers what we call the domino effect − which creates a parasite party that may lead to cancer. 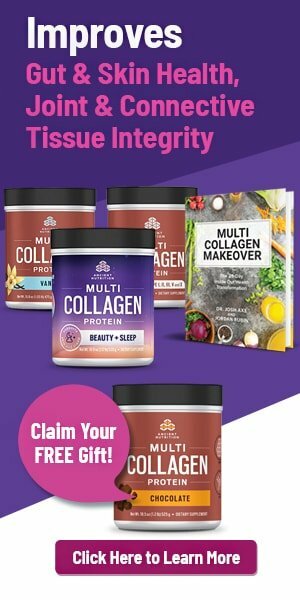 What throws this domino effect into high gear is when the naturally occurring candida yeast in your body is forced to mutate into Candida Albicans (fungus). When this happens the candida yeast in your digestive tract mutates into a life-threatening predator. 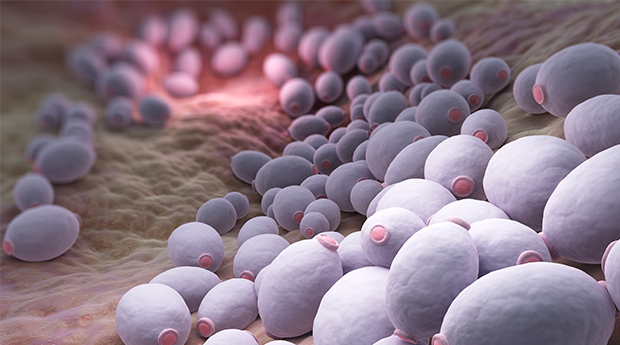 What Creates Candida Albicans in the Body? Taking antibiotics can either kill or convert your good bacteria into bad bacteria. Antibiotics create fungus, which undermines and can even wipe out the entire immune system within your body. With over 250 million antibiotic prescriptions written each year by our medical system, we run the risk of being weak and unable to fight sickness. The human body has approximately 85 trillion cells in the body. Each and every person has the choice to have 10 times more good bacteria or bad bacteria. We are literally walking globs of bacteria. Whether they become good or bad bacteria depends solely on the choices you make each day. Talking about choices, look what happens when you let someone else master your health and well-being. When you hand your health over to a doctor who has an unhealthy education and take their prescription antibiotics, your good bacteria will now transform into bad bacteria or die. This will set off a chain reaction creating hundreds of thousands of microscopic fungus-producing factories called Candida Albicans. This fungus will now proceed to undermine the major part of your immune system. It will root in and drill pinholes through the walls of the large intestine and into your bloodstream. These pin-like holes allow toxic waste, fungus, bad bacteria, and worms to enter freely into the bloodstream from the large intestine. This condition is mainly known as leaky gut, or malabsorption syndrome, and is the major cause of autoimmune diseases today. Once in the blood stream these parasitical invaders now have an open door to the rest of your body. Candida Albicans (fungus) are anaerobic. This means they can generate their own energy and thrive in the absence of oxygen. Once in the blood stream these anaerobes search out and attach themselves to compromised, unhealthy, low-frequency tissue cells. These low vibrational compromised areas in your body are known as your weak links. Where Are Your Weak Links? We all have weak links in our body. Just like a weak link in the chain of a bicycle, your body’s weak links are found in the tissues, bones, and vital organs. You know what and where your weak links are. They stick out and scream at you when you’re run down, eat unhealthy, or when you’re emotionally out of balance. When your body’s frequency − otherwise known as energy − is lowered by physical or unprocessed emotional toxins, these toxins will settle into areas of the body that give off a matching frequency. These compromised areas of the body become weak links that will eventually become parasite-ridden with worms, bad bacteria, and fungus. These weak links are mainly comprised of unhealthy low-frequency tissues that act as an alarm, presenting as inflammation, pain, stiffness, and internal scar tissue. The same scar tissue that is created by inflammation is the same scar tissue that you will find in a tumor. This is called unconscious living, which the majority of population has unknowingly bought into. Inflammation, pain, and stiffness are not only warning signs, but they are also your body’s GPS that shows your defenses are weak and your immune system is down. If these compromised low-frequency tissues are not reinforced and returned to their natural state of health, they will become home base to millions of microscopic, fungal-producing factories that will pave the way for a parasitical invasion. This parasitical invasion will begin at your weak links and spread outward consuming the rest of your body, one cell at a time. One of the main objectives of any parasite is to act like a search and destroy team. It will decompose what is already perceived to be decomposing, draining whatever life force is left in the tissue cells and changing (mutating) those weak, compromised tissue cells to become anaerobic. This unhealthy environment will eventually lead to the suffocation and starvation of healthier tissue cells. Fungus is opportunistic. When it finds a weak link it will then set up home and attach itself onto the outer membrane of the tissue cell, preventing crucial receptor sites from working properly. It will block the needed nutrients and oxygen from these already compromised tissue cells. To survive, these compromised tissue cells must either mutate to match the frequency of the fungus, become anaerobic, make sugar their number one food source, or die of suffocation and starvation. The main objective of any and all living organisms is survival. For their survival your cells will choose mutation over death, whenever possible. To mutate, they must switch their energy production from an oxygen-based system to one that does not use or need oxygen. Once mutated into cancer cells, they no longer use oxygen to generate their energy from food molecules. A cancer cell’s main food source is sugar. What a coincidence − the same fungus that caused these tissue cells to mutate into cancer cells is feeding the cancer cells with its sugary-like waste (poop). The domino effect of self-poisoning will continue unless you take personal action and reclaim your health. Get trained on how to master your health, heal the body and awaken the mind. When we learn to respect and protect the large intestine by gently cleansing on a daily basis we will be protecting the mother of all organs and permanently ending the domino effect of self-poisoning. We rely on health heroes like you to help us spread the word on this important, life saving information. Please share it with friends using the email and social media buttons below. The intestines are called the “second brain” because they are home to approximately 85% of your immune system. When the large intestine goes from being the body’s sewage system to a cesspool of stagnated waste it triggers a domino effect which creates a parasite party that may lead to cancer. When the naturally occurring candida yeast in your body is forced to mutate into Candida Albicans (fungus) it becomes a life-threatening predator. Candida Albicans will drill pinholes through the walls of the large intestine that allow toxic waste, fungus, bad bacteria, and worms to enter freely into the bloodstream. This condition is mainly known as leaky gut, or malabsorption syndrome, and is the major cause of autoimmune diseases today. Compromised areas of the body become weak links that will eventually become parasite-ridden with worms, bad bacteria, and fungus. When we learn to respect and protect the large intestine by gently cleansing on a daily basis we will be protecting the mother of all organs and permanently ending the domino effect of self-poisoning. High Cortisol Levels and Breast Cancer: What’s the Connection? When doctors give antibiotics to us to help cure the infection, they think that they are doing us good and making us healthier. However, they are just really making us sicker, because some people are allergic to penicillin. We never know what we put in our intestines. The doctors never tell us the truth anyway. So why do so many people I know , including family members, that ingest a lot of sugar, whereas me, a vegetarian, but a wine drinker, end up with breast cancer. I have read enough blogs, etc. that the consensus is, that once you get pegged with cancer, even if you do this or don’t do that, it DOES return and hospice is your future. Please prove me wrong. GMO veggies will cause cancer and a whole host of unknown diseases. Wine is made with yeast and if the wine has been racked and bottled without the yeast being 100% dead, you could very well end up with a Candida infection that will eventually lead to some form of cancer, since cancer is a fungus or the fact that Yeast or other funguses may grow on the outside of a tumor, the body’s response to the invasion of fungus to a tumor is to cover it with more cancer cells. The body’s reaction to invasion by fungus or mold is to eliminate the fungus with cancer cells, which are macrophages, a part of the immune system that eliminates this condition. However, the fungus Candida Albicans can mutate to form a cancer cell escaping fungus which will always escape and grow out of control over the outer surface of the malignant tumor. It is well known to eliminate these conditions by raising and keeping your body’s PH over 5.5, raising O2 blood levels to a point where cancers could never survive. This could be done with Cannabis oil in therapeutic cancer doses of 250 mg 4 times daily (after a 2 week period of ingesting 15 to 20 mg more daily until you reach this dose.) The cannabis treatment also kills candida and it eliminates die off symptoms dramatically by allowing the symptoms to be radically tamed by the effects of the thc, offering a much more pleasant result. The final piece to the puzzle is to eliminate all sugars from the diet and eat fruits only when blood sugar is low enough to cause dizziness. Cravings for sugars will be very high and must be forcefully eliminated as well as all refined carbs . Lowered carbs to a point of ketosis must be met to allow the cancer to recede and stop the body from sending the cancer cells to kill or encapsulate funguses in the first place. just kill the bad fungus with iodine/lugols as I did and cured my cancer in 6 days. Nice! I will tell my mother in law this. By the way, how much Iodine could be consumed without poisoning the body? How is it taken and how did you figure out how much to take without any ill effects? I thought iodine had to be slowly introduced into the body by oral ingestion with the intake of salts? Please let me know when you get a moment. Her cancer has come back with a vengeance and I think it is her Doctor telling her if she could ingest food, eat anything she craves as often as she could as she is like skin and bones and she loves sweets. I told her to eliminate sweets and when she did, the cancerous tumors were in the millimeter sizes. She has since been eating cakes and other things, processed foods, etc due tot he fact that she has been vaporizing cannabis and is starting to get the munchies, but her cancer has been growing again and the cannabis dosing had to be raised to stop her tumors from literally forcing her Liver into an area where the colon is. She has become extremely uncomfortable, especially due to the fact that the doctor is scaring her with expectations of death at specific times. 3 years ago just before she started the cannabis oil, she was given 6 months to live having stage 4 Cholangiocarcinoma. 3 months later after 250mg 4 times a day of RSO, her cancer was nearly gone, but she was following my advice , not eating or drinking sugary foods, starches or carbs to a certain point. She has since become a bit less worried about the reduction of sugars and carbs, she stopped increasing alkaline foods and beverages, and she has been complaining about feeling the hallucinogenic effects of cannabis oil and CBD crystals since she would start hallucinating once she became tired, normally by 5pm nightly. Her dispensary basicall told her she only needs 500mg daily of cannabis oil,. but she was reduced to this level once her cancer was nearly gone and within 3 to 6 months, her tumors grew to over 7.6 cm from less than 4 and 5 mm per tumor, so it goes to show how well the cannabis oil assists in the reduction of tumor size as well as the metastasis of the cancer itself, which by the way hasn’t spread, but we are afraid it will unless steps are taken to raise the ph in her body to 7.5, raise blood oxygen levels and reduce the food for cancer and fungi, which is sugars and carbs or anything that will convert into sugars of any kind. It’s a difficult thing to change your entire diet to bland things you normally wouldn’t eat. She said she would rather die because she has become so sick of worrying and hearing the doctors telling her she only has so much time to live. She figures that she should try to enjoy the foods she loves now since she may only have months to live, but the cancer doctor said 6 months already 3 years ago. Since they have invested over 300k on chemo and 45k on cannabis. She doesn’t want to waste any more money to keep herself alive. She feels she is a financial burden on the entire family, but we’d like her to be around another 20 years if we could show promising results that could actually raise her positivity once again. I would suggest 50 mg/day in water .see “lynne farrow the iodine crisis”. which country are you in? Good article…but do not leave me hanging! How do we gently detox our large intestine?? Yes, what is the plan the cleanse the intestine? Well you can start by cutting out sugar, meat and dairy, and gluten; thse foods block the bowel and interfere with gut health.Instead eat lots of raw vegetables, take a herbal bowel powder, (see a local herbalist) and supplement with a good probiotic. You can use superfoods, like spriulina to support you while detoxing. Colonics can help, but bowel powders are better in the long run. You can also get in touch with your emotions: resentments and old emotions are stored in the bowel, they need to be acknowledged and expressed so you can move on from them. The article advises “gently cleansing on a daily basis”. How? Is there anyone responding to the request? did you get a reply ? ca. 6 drops iodine/lugols in water daily to continually detox…celtic salt to rebuild healthy cells…see lynne farrow the iodine crisis and barbara o’neill the true cause of disease…I cured my cancer in 6 days by killing the fungus with iodine/lugols. I agree with the recommendations above. I would also support your digestive system by drinking water with lemon essential oils (100% pure, therapeutic grade only). thank you , moderator for including my replies. docofdetox.com cleansing tea It gives you amazing results! I love it! He has an 800 number to call and either he or one of his staff will answer all your questions. They are very helpful and he says, “No question will go unanswered.” I do know that I called one time and his assistant, Abby, called me back. She explained to me which products she recommended for my specific needs and she, kindly, told me her schedule each day. She helped me immensely! Also, I talked to Dr. Wolfe and he was able to tell me (after I told him my symptoms) exactly what was the problem, recommended the products and said I could skype him if I needed him to show me how to use the Belly Button tool. Don’t hesitate to call. They will help you. Plus, he has a question and answer radio/online program where people call in and ask him questions as well. Can this lugols Iodine treat Vaginal candidiasis? Asking for a patient. Please share information. I have this friend who’s been treating candidiasis for over 10 years but still persisting. She’s tried all sorts of Fluconazoles and the likes, Nystatin pessaries and the likes but no improvement. How can she get help? We’re not able to give medical advice, but we do have a list of doctors we interviewed in the Global series.